The Reminiscent Exile is a series of urban fantasy novels written by Joe Ducie. The stories tell the tale of Declan Hale, a man with no shadow – who has died and died again – and his exile to True Earth. Expelled from the Knights Infernal for inciting a genocide against the peoples of the mythical realm of Forget, Declan spends his days managing a small bookshop in Perth. But the past has a way of biting, does it not? And Declan’s past has more teeth than most. Join Declan as he is forced to fight for his life and right mistakes made in the heat of war. Just finished reading Distant Star tonight (hadn’t had the chance to read it, up to my neck in final exams and essays ’til a week ago) – fantastic. Will have a review up on Amazon soon, but I just wanted you to know I really enjoyed it and I’m recommending it to all two of my friends. Thanks, mate. Looking forward to that review! Always good to hear someone liked the tale. To my eternal surprise, I somehow found a copy of Distant Star (The Reminiscient Exile) on my carousel of books. Prior to.seeing it in.that very moment, I had never heard of it. Apparently, the gods have a sense of.humor and.like playing tricks on me. In this case, I absolutely came out on top. I picked up Distant.Star today in order.to.avoid the rather obnoxious gathering of.drunken family members. 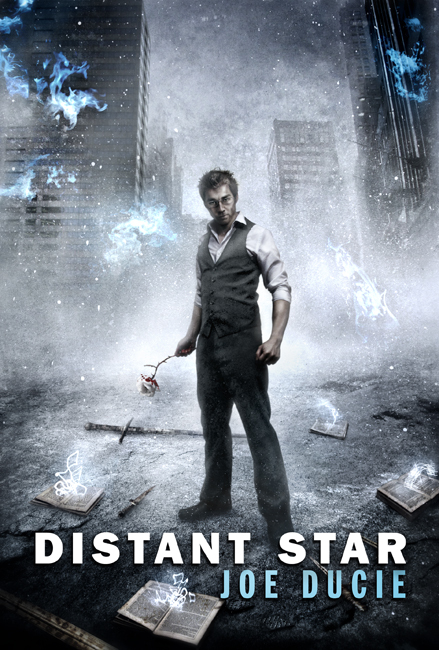 Getting out of the heat and back.into A/C, I picked up Distant Star (The Reminiscent Exile) and I was instantly drawn into.the.novel – pulled in spirit right into. the world of your book. An ironic description given the nature of.books.in your world. I finished the book a few hours later – I couldn’t put it.down. Here was this book.that I.had never heard of, and suddenly I’d plowed through the book, but I was utterly enchanted with the world and the storytelling. The characters had enough depth to pull you in, and then you were able. to.lean some.more.about them throughout, but you’re still left with the feeling that you’ve only scratched the surface of these character. This book, in my opinion, is s masterpiece of creative storytelling. I’ve already purchased copies from Amazon (I’ll be posting this review there as well) for several friends who are my willing subjects, If I come across something I think they’ll like, they usually get a random book in the.mail. This is one of the few truly original concepts that have appeared in the last two decades, since Urban Fantasy was really introduced. Thank you for the time and thank for all.the hard work you put in. Just word vacuumed the first three books of “The Reminiscent Exile” in a little under 5 days (yay for vacation time and crappy weather). Though Bourbon/Whiskey is my succor of choice as opposed to Scotch; f’ing brilliant prose! I found your books while looking for a different plot, not the same old, same old that I can read 10-15% of the book and know exactly how it will pan out/end type of garbage that is so frequent these days. Though there were a few times when I could guess the next event(s) in the books for the most part, awesome! Though, I did get very tired of Sophie bursting into tears all the time; initially I had imagined her a stronger chracter/woman and her prevalence throughout the books made it pretty annoying. I am certain I’m in the majority when I say that I can’t wait for the next book. I am recommending it to all my sci-fi/fantasy reading friends.